In order to properly understand what actually happens to someone with MS, we must first discuss the ways in which these body parts work in a person living without MS. The neurons are structures composed of a cell body as well as an axon – the part of the cell body that carries messages from place to place. These neurons are incredibly important to our body – they allow us to see, think, hear, feel, speak, eliminate and move. The axons, the part of the nervous system that carries messages around the body is coated with myelin, sort of like a barrier around an electrical wire, are comprised of proteins and a lipid rich substance. This myelin sheath insulates and protects the axon to help increase the speed of nerve transmissions. Myelin is present in the central nervous system (CNS) and peripheral nervous system (PNS); however only the central nervous system is affected by MS. CNS myelin is produced by special cells called oligodendrocytes. PNS myelin is produced by Schwann cells. The two types of myelin are chemically different, but they both perform the same function — to promote efficient transmission of a nerve impulse along the axon. Damage to the myelin sheath is caused by inflammation and can occur anywhere in the central nervous system, including the brain and spinal cord. The optic nerves are also frequently affected.Multiple sclerosis is a chronic disease that affects the nervous system. It is often difficult to diagnose because symptoms frequently come and go, and can also mimic other diseases. MS affects more women than men, and patients are usually diagnosed between the ages of 20 and 50, although MS can occur in young children, teenagers, and older adults. What Is Abnormal Immune System Response in MS? What is known is that when the myelin sheath surrounding a nerve cell is damaged by inflammation, scar tissue forms (a process called sclerosis), resulting in the slowing down or stopping of the impulses that travel along the nerve cell. This means that the impulses cannot travel effectively across the nerve cells, the affected area cannot function correctly, and the symptoms of MS appear. CIS is the first episode of neurologic symptoms caused by inflammation and demyelination in the central nervous system. By definition, this episode must last for at least 24 hours and is very characteristic of multiple sclerosis, however it doesn’t yet meet the criteria for a proper diagnosis of MS. People who experience a CIS may or may not develop MS.
Monofocal episode: A person experiences a single neurologic sign or symptom – such as an attack of optic neuritis – caused by a single lesion. Multifocal episode: The person experiences more than one sign or symptom – such an attack of optic neuritis accompanied by numbness or tingling in the legs – caused by lesions in more than one place. People who experience Clinically-Isolated Syndrome may or may not go on to develop MS. While diagnosing the healthcare provider faces two challenges: first, determining whether the person is experiencing damage in the CNS; and second, to determine the chance that a person experiencing this type event will go onto develop MS.
Higher risk for developing MS: When CIS is accompanied by magnetic resonance imaging (MRI)-detected brain lesions similar to those seen in MS, the person has a 60 to 80 percent chance of a second neurologic event and diagnosis of MS within several years. Lower risk for developing MS: When CIS is not accompanied by MRI-detected brain lesions, the person has about a 20 percent chance of developing MS over the same period of time. People with CIS who are at high risk for developing MS may now be treated with a disease-modifying therapy approved by the U.S. Food and Drug Administration (FDA) for that purpose. Early treatment of CIS has been shown to delay onset of MS.
RRMS is the most common disease course of MS (Approximately 85 percent of people with MS are initially diagnosed with RRMS) that is characterized by clearly-defined attacks of new or increasing neurologic symptoms (attacks can take the form of worsening of old symptoms or appearance of new symptoms depending upon which areas of the nervous system are affected). These attacks (also known as relapses and exacerbations) are generally followed by partial or complete recovery (called “remissions”). Following a relapse, the new symptoms may disappear without causing any increase in level of disability, or the new symptoms may partially disappear, resulting in an increase in disability. New lesions on MRI often occur as part of a relapse. However, new MRI lesions indicating MS activity may also occur without symptoms of which the person is aware. During remissions, all or some symptoms may disappear while others become permanent. There are no obvious progressions of MS during periods of remissions. Worsening – diagnosed increase in disability over a period of time following a relapse. Symptoms of RRMS: People with progressive forms of MS are more likely to experience gradually worsening problems with walking and mobility, in addition to other symptoms they may have. Problems with cognition (including learning, memory, and information, or information processing). If evidence of dissemination in time and space is clear from a person’s medical history and neurologic exam, a diagnosis may be made very quickly. Tests used to help confirm the presence of damage in the CNS include magnetic resonance imaging (MRI), visual evoked potential (VEP) testing, and analysis of the cerebrospinal fluid that surrounds the spinal cord. People who have experienced only one episode of neurologic damage – known as a clinically-isolated syndrome – may need to wait some time for a confirmed diagnosis of MS.
SPMS first follows a relapsing-remitting course in which their systems come and go. Most people who are diagnosed with RRMS will eventually transition to a secondary progressive course in which there is a progressive worsening of neurologic function (accumulation of disability) over time. SPMS follows after relapsing-remitting MS. Disability gradually increases over time, with or without evidence of relapses or changes on MRI. In SPMS, occasional relapses may occur, as well as periods of stability. SPMS occurs in people who initially had relapsing-remitting MS. In other words, SPMS occurs as a second phase of the disease for many people. Primary progressive MS (PPMS) is the first — and only — phase of the illness for approximately 15 percent of people with MS. In SPMS, people may or may not continue to experience relapses; the disease gradually changes from the inflammatory process seen in RRMS to a more steadily progressive phase characterized by nerve damage or loss. PPMS is characterized by worsening neurologic function (accumulation of disability) from the onset of symptoms, without early relapses or remissions. Approximately 15 percent of people with MS are diagnosed with PPMS. PPMS can be further characterized at different points in time as either active (with an occasional relapse and/or evidence of new MRI activity) or not active, as well as with progression (evidence of disease worsening on an objective measure of change over time, with or without relapse or new MRI activity) or without progression. As of today, the cause of MS is not known. Scientists believe MS is triggered by a combination of factors. To identify the cause, research is ongoing in areas of immunology (the study of the body’s immune system), epidemiology (the study of disease patterns in large groups of people) and genetics (understanding the genes that may not be functioning correctly in people who develop MS). Scientists are also studying infectious agents that may play a role. Understanding what causes MS will speed the process of finding more effective ways to treat it and — ultimately — cure it, or even prevent it from occurring in the first place. In recent years, researchers have identified immune cells that target the CNS in people with MS, some of the factors that cause them to respond abnormally, and the process of the immune system response. Ongoing efforts to learn more about the immune-mediated process in MS — what sets it in motion, and how to slow or stop it — will bring us closer to understanding the cause of MS.Although the cause of MS is not known, more is being learned about environmental factors that contribute to the risk of developing MS. There is no single risk factor that provokes MS, but several factors are believed to contribute to the overall risk. Multiple sclerosis occurs more often in areas farther from the equator. Scientists who study disease patterns in large groups of people trying to understand why and are looking at changes in geography, demographics (age, gender, and ethnic background), genetics, infectious causes, and migration patterns. Some data suggest that exposure to some environmental agent before puberty may predispose a person to develop MS later on. Growing evidence suggests that vitamin D may an important role in MS. Low vitamin D levels in the blood have been identified as a risk factor in the development of MS. Some researchers believe that increased exposure to the sun (a natural form of Vitamin D) – such as experienced by people in areas closer to the equator, may support immune function and help protect us from MS and other diseases similar to MS. Researchers have begun to suspect that smoking plays an important role in the development of multiple sclerosis. Studies show that smoking increases a person’s risk of developing MS and is associated with more severe disease and more rapid disease progression. This evidence also suggests that stopping smoking — before or after the onset of MS — is associated with a slower progression of MS disability. Childhood obesity, notably in girls, puts children at an increased the risk for developing MS. Other studies show that obesity in early adulthood may also contribute to an increased of developing MS. Also, obesity may contribute to inflammation and more MS activity in those already diagnosed with MS. Many viruses and bacteria — including measles, herpes simplex virus-5, EBV, canine distemper, human herpes virus-6, and Chlamydia pneumonia — are being investigated to determine their involvement in the development of MS. EBV, the virus that causes mononucleosis, has received significant attention in recent years. A growing number of research findings indicate that previous infection with EBV contributes to the risk of developing MS.
MS is not an inherited disease, meaning it is not a disease that is passed down through generations. However, there is genetic risk that may be inherited. In the general population, the risk of developing MS is about 1 in 750 – 1000. In identical twins, if one twin has MS the risk that the other twin will develop MS is about 1 in 4. The risk of developing MS is also increased when other first degree relative (parents, siblings and children) have MS, but far less than in identical twins. About 200 genes have been identified that each contribute a small amount to the overall risk of developing MS. 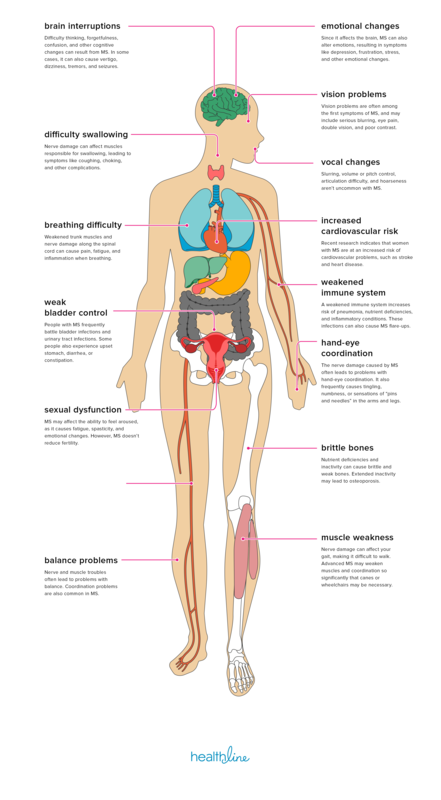 Patients with MS experience a variety of symptoms with a wide range of severity, depending upon which area of the central nervous system is affected and the course of their particular disease. More than one area can be affected at a time. No two patients’ symptoms are exactly alike. Bladder Problems: Bladder dysfunction, occurring in at least 80% of people with MS, can often be managed quite successfully with medications, fluid management, and intermittent self-catheterization. Bowel Problems: Constipation is a particular concern among people with MS, as is loss of control of the bowels. Bowel issues can typically be managed through diet, adequate fluid intake, physical activity, and medication. Cognitive Changes: a range of high-level brain functions are affected in more than 50% of people with MS, including the ability to process incoming information, learn, remember new information, organize, problem-solve, focus attention, and accurately perceive the environment. Depression: Studies have suggested that major depressive disorder – the most severe type of depression – is one of the most common symptoms of MS. It is more common among people with MS than it is in the general population or in people who have many other chronic, disabling conditions. Dizziness and Vertigo: People with MS may feel off balance or lightheaded, or -less often – have the sensation that they or their surroundings are spinning (vertigo). Fatigue: occurs in about 80% of people with MS and can significantly interfere with the ability to function at home and work. In fact, fatigue may be the most prominent symptom in a person who otherwise has minimal activity limitations. Numbness or Tingling: Numbness of the face, body, or extremities (arms and legs) is often the first symptom experienced by those eventually diagnosed as having MS. Pain: Pain syndromes are common in MS. In one study, 55% of people with MS had “clinically significant pain” at some time, and almost half had chronic pain. Sexual Problems: are very common in the general population including people with MS. Sexual responses can be affected by damage in the central nervous system, as well by symptoms such as fatigue and spasticity, and by psychological factors. Spasticity: Refers to feelings of stiffness and a wide range of involuntary muscle spasms. These spasms can occur in any limb, but it is much more common in the legs. Walking (Gait) Difficulties: Related to several factors including weakness, spasticity, loss of balance, sensory deficit and fatigue, walking and gait challenges can sometimes be helped by physical therapy, assistive therapy, and medications. Weakness; Weakness in MS, which results from de-conditioning of unused muscles or damage to nerves that stimulate muscles. Weakness may be managed with rehabilitation strategies and the use of mobility aids and other assistive devices. Vision Problems: The first symptom of MS for many people. Onset of blurred vision, poor contrast or color vision, and pain on eye movement can be frightening and should be evaluated promptly. Breathing Problems: Respiration problems occur in people whose chest muscles have been severely weakened by damage to the nerves that control those muscles. Headache Although headache is not a common symptom of MS, some reports suggest that people with MS have an increased incidence of certain types of headache. Itching: is one of the family of abnormal sensations — such as “pins and needles” and burning, stabbing or tearing pains — which may be experienced by people with MS. Speech Problems: Speech problems, including slurring and loss of volume occur in approximately 25-40% of people with MS, particularly later in the disease course and during periods of extreme fatigue. Stuttering is occasionally reported as well. Swallowing Problems Swallowing problems result from damage to the nerves controlling the many small muscles in the mouth and throat. Tremor: Tremor, or uncontrollable shaking, can occur in various parts of the body because of damaged areas along the complex nerve pathways that are responsible for coordination of movements. Seizures: Seizures, the result of abnormal electrical discharges in an injured or scarred area of the brain, have been estimated to occur in 2-5% people with MS, compared to the estimated 3% of the general population. Bladder dysfunction can cause repeated urinary tract infections. Immobility can lead to pressure sores. While secondary symptoms can be treated, the optimal goal is to avoid them by treating the primary symptoms. Tertiary symptoms are the “trickle down” effects of the disease on your life. These symptoms include social, vocational, and psychological complications. For example, if you are no longer able to drive or walk, you may not be able to hold down your usual job. The stress and strain of dealing with MS often alters social networks and sometimes fractures relationships. Problems with bladder control, tremor or swallowing may cause people to withdraw from social interactions and become isolated. What Are The Effects of Multiple Sclerosis on the Body? People who are living with frightening and uncomfortable symptoms want and need to know the reason for their discomfort. Getting the diagnosis allows them to begin the adjustment process and relieves them of worries about other diseases such as cancer. Since we now know that permanent neurologic damage can occur even in the earliest stages of MS, it is important to confirm the diagnosis so that the appropriate treatment(s) can be initiated as early in the disease process as possible. At this time, there are no symptoms, physical findings or laboratory tests that can — by themselves — determine if a person has MS. The doctor uses several strategies to determine if a person meets the MS diagnostic criteria. Beginning in 2001, the International Panel on the Diagnosis of Multiple Sclerosis began updating these longstanding criteria to include specific guidelines for using magnetic resonance imaging (MRI), cerebrospinal fluid (CSF) analysis, and visual evoked potentials (EP) to speed the diagnostic process. These tests have been used to look for a second area of damage in a person who has experienced only one relapse (also called an attack or exacerbation) of MS-like symptoms — referred to as a clinically-isolated syndrome (CIS). A person with CIS may or may not go on to develop MS. With advances in MRI technology and other developments, the criteria (now referred to as The Revised McDonald Criteria) were revised again in 2005, 2010 and 2017 to make the process easier and more efficient. The 2017 revision specifies how findings on MRI and in the cerebrospinal fluid can determine whether a person has MS.
All other possible diagnoses have been ruled out. Comprehensive MS care is only part of a person’s overall health management techniques. Like the general population, people with MS are subject to medical problems that have nothing to do with their MS — which means that regular visits with a primary care physician and age-appropriate screening tests are just as important for them as they are for everyone else. And the same goes for family members — their health and well-being are also a priority. t.
More than a dozen disease-modifying medications have been approved by the U.S. Food and Drug Administration (FDA) to treat relapsing forms of MS. One has been approved to treat both relapsing MS and primary-progressive MS.These medications reduce the frequency and severity of relapses (also called attacks or exacerbations), reduce the accumulation of lesions in the brain and spinal cord as seen on MRI. and may slow the accumulation of disability for many people with MS.
An exacerbation of MS is caused by inflammation in the central nervous system (CNS) that causes damage to the myelin and slows or blocks the transmission of nerve impulses. To be a true exacerbation, the attack must last at least 24 hours and be separated from a previous exacerbation by at least 30 days. However, most exacerbations last from a few days to several weeks or even months. Exacerbations can be mild or severe enough to interfere with a person’s ability to function at home and at work. Severe exacerbations are most commonly treated with high-dose corticosteroids to reduce the inflammation. In people who have MS, the damage to the myelin and nerve fibers interferes with the transmission of nerve signals between the brain and spinal cord and other parts of the body. This disruption of nerve signals causes the symptoms of MS, which vary depending on where the damage has occurred. MS symptoms can be effectively managed with a comprehensive treatment approach that includes medication(s) and rehabilitation. Rehabilitation programs focus on function — they are designed to help you improve or maintain your ability to perform effectively and safely at home and at work. Rehabilitation professionals focus on overall fitness and energy management, while addressing problems with accessibility and mobility, speech and swallowing, and memory, and other cognitive functions. Rehabilitation is an important component of comprehensive, quality healthcare for people with MS at all stages of the disease. Rehabilitation programs include cognitive and vocational rehabilitation, physical and occupational therapy, therapy for speech, swallowing problems, and more. Comprehensive care includes attention to emotional health as well as physical health. Mental health professionals provide support and education, as well as diagnosing and treating the depression, anxiety and other mood changes that are so common in MS. Neuropsychologists assess and treat cognitive problems. Multiple Sclerosis Foundation (MSF) is a site dedicated to supporting and educating those touched by MS. They also offer a directory of MS support groups by state. Multiple Sclerosis International Foundation (MSIF) is a worldwide foundation that connects patients and professionals. The MS International Federation is a unique global network of MS organizations, people affected by MS, volunteers and staff from around the world. Our movement is made up of 48 MS organisations with links to many others. National Institute of Neurological Disorders and Stroke – Multiple Sclerosis provides information and educational information about multiple sclerosis.